This cool picture came from this site. Are you reading something special next week? or maybe you have your own list to share. 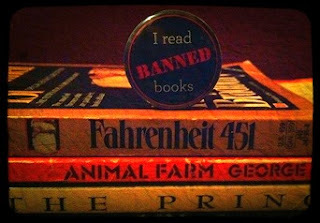 Share your favorite banned book with us! I've never read In Cold Blood, but it's been on my "some day" list for a while. I just downloaded it. We'll see if I can get through the whole thing next week. From the bit I've delved into so far, the writing is awesome.